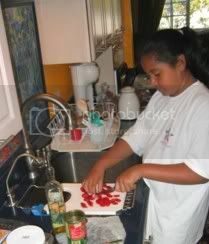 Jade is presently on summer vacation, but the girl has not stopped cooking. She has been dazzling her grandma and aunts with her cooking. She has even put her Auntie O’s brand new kitchen to good use, making this scrumptious looking pizza for her and her cousins. I’m not really sure what she has on the pizza, I’ll let her write her recipe down whenever she gets a chance. type ba ni Jade magbakasyon dine? 😀 hi Jade 🙂 you’ve got a great talent for cooking! Hi babe!! I just couldn’t help bragging a bit 🙂 You can still post your recipe. I wasn’t sure what all your ingredients were. Oh, lucky grandma..she gets to experience first-hand the fruits of her labor..